Lettuce wraps are kinda like tacos: most fillings work, depending on your mood. There’s no right or wrong combination; as long as it tastes good together, it will likely taste good wrapped up in lettuce. At least, that was my thought when I went to create these vegan peanut tofu lettuce wraps. I arrived home from Scottsdale on Friday, and BL told me in no uncertain terms that he wanted pad Thai for dinner that night. I did end up missing his birthday while I was away on work, so I was more than happy to oblige his request. But then, I mentioned that I wanted to make some kind of lettuce wrap this weekend and he was convinced he wanted those instead for dinner. What about both? 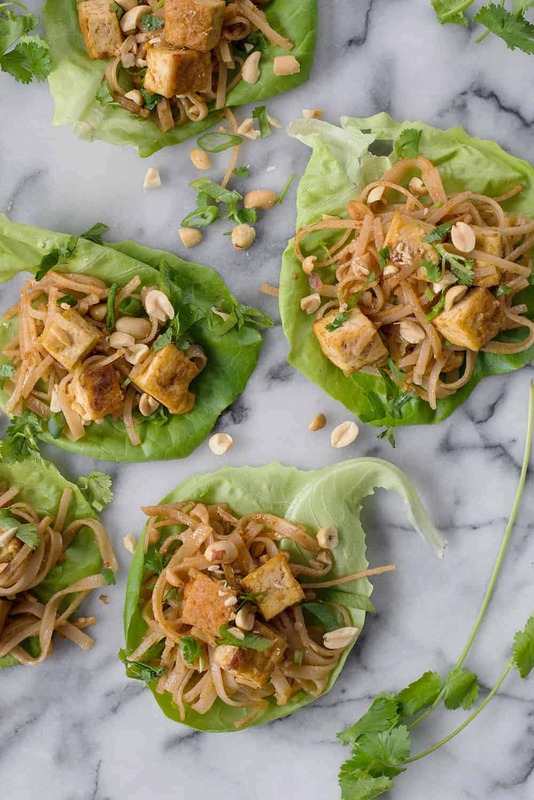 Pad thai-ish wrapped in butter lettuce leaves? It seemed crazy enough that it just might work. 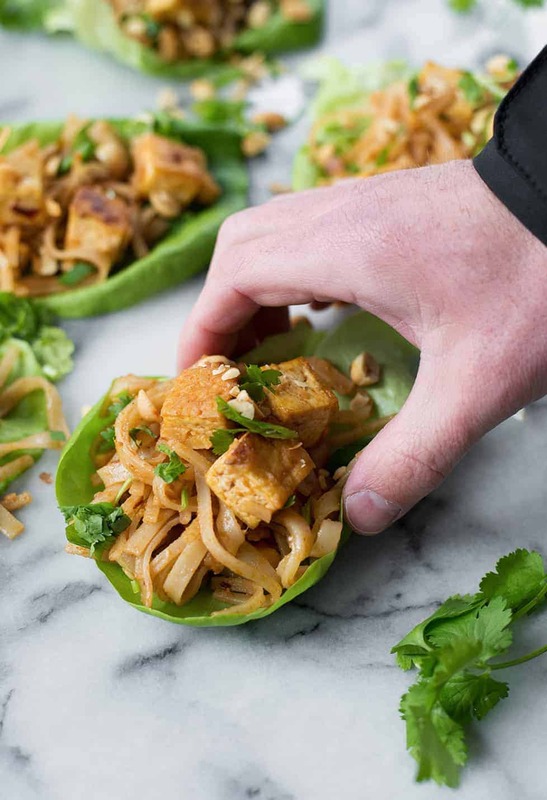 If you like peanut sauce, crispy tofu and rice noodles then these peanut tofu lettuce wraps are decidedly for you. 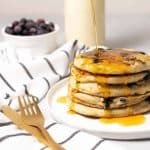 They are also fairly easy to whip up and both vegan and gluten-free. I’m using my fool-proof method for crispy tofu, sans oil. 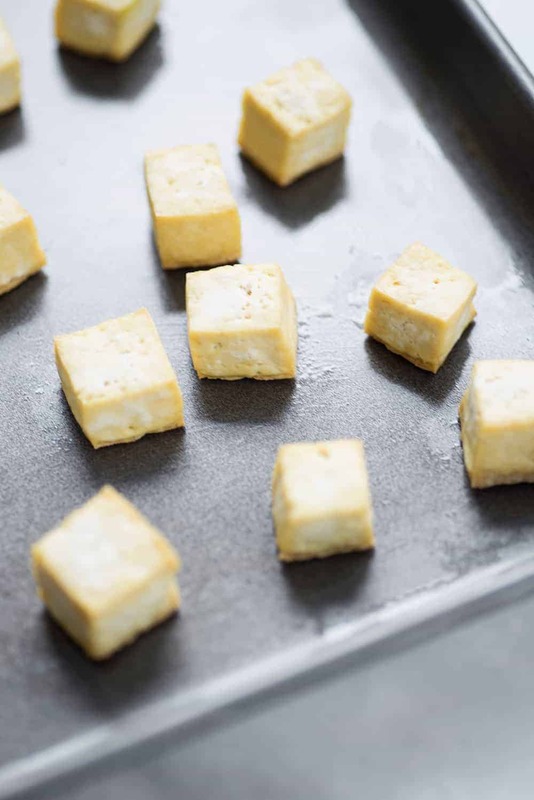 Coat a non-stick baking sheet with just a little bit of oil, then place the cubed tofu on top. As it bakes, the tofu will crisp up and release from the pan. This method creates chewy, delicious tofu that only tastes like it was deep fried. But what about tofu you say? I’ve gotten a few emails lately around the health benefits of soy, so… let’s chat. Search soy on the internet and you’ll find some crazy claims… mostly from those who don’t understand or confuse the science. Nutrition science is complicated, mostly because we don’t eat in silos. Some research, like mice and other animal studies, are done with large amounts of a single food. Which, obviously isn’t how we eat. Other studies are done with asking about food patterns, and relying on individuals to be truthful in their responses while also weeding out other factors like genetics, age, and other lifestyle factors that contribute to overall health. It’s also hard to make causation claims based on these studies. We know a lot, but there is also much that needs to be answered. And, some studies do contradict themselves. Let’s take a deeper dive then into what is said about soy. Practically everyone has heard that soy can increase estrogen levels, which studies have shown is linked to breast and ovarian cancers. But how legit is this? A lot of panic over soy and breast cancer stemmed from a single 1998 study in mice, which showed that soy isoflavones, which act similarly but are NOT estrogen, caused existing breast tumors to grow. They concluded that then eating soy could make breast cancer worse. Since then, several more studies have looked at the effect of eating soy on breast cancers and found that consuming soy after diagnosis actually reduced recurrence and survival—meaning that survivors who ate soy were less likely to have cancer come back. This is also what we see when we look at the population studies done in Asian women who eat traditional Asian diets (soy foods are common); they have reduced risk of breast cancer. A 2006 meta-analysis that involved 11,224 survivors also showed that eating soy after a breast cancer diagnosis reduced overall mortality. It’s why the American Cancer Society and the American Institute for Cancer Research say that breast cancer patients can safely consume soy. This topic is obviously dear to my heart, with our personal fertility struggles. People hear phytoestrogen and of course, estrogen and fertility comes to mind. And, some research has fueled these fears: a 2009 study analysis found that pre-menopausal women who eat soy products saw a slight decrease in two important hormones for fertility. And a 2008 study found that soy’s estrogen-mimicking compounds can reduce fertility in female mice. However, this connection is still pretty tenuous, and most other research actually suggests that eating moderate amounts of soy can be helpful if you’re looking to conceive. What doesn’t help? Animal protein. One of the most significant long-term studies, the Nurses’ Health Study II (NHS II), found that women who ate larger amounts of animal protein were more likely to have fertility problems. The researchers concluded that adding one serving of beans, peas, nuts, peanuts, tofu, and soybeans may protect against ovulatory infertility. 3. How much soy is safe? Like anything, I don’t recommend eating just one food. I include probably one serving of soy a day, because it’s a great source of lysine, which can be a limiting amino acid in a mostly plant-based diet. There isn’t a line on where soy is considered safe vs. unsafe, but most research bodies say 2-4 servings of soy a day is safe. 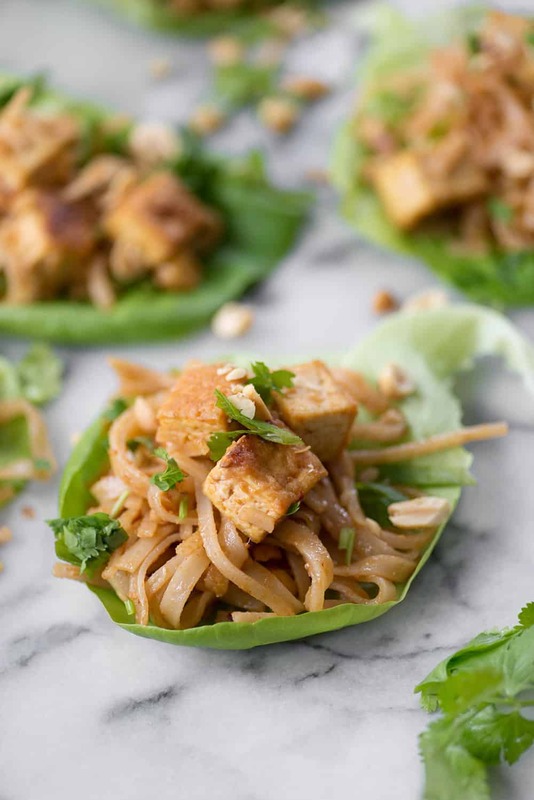 Vegan Peanut Tofu Lettuce Wraps! If you are looking for a yummy vegan and gluten-free dinner idea, this is it! Spicy peanut sauce tossed with rice noodles and crispy tofu. Whisk together all of the sauce ingredients (soy sauce, peanut butter, water, sambal oelek, sugar, ginger, lime juice/zest, garlic cloves, rice wine vinegar) in a small bowl. Set aside. Cube the tofu and place on a non-stick baking sheet, or a lightly sprayed baking sheet. Bake for 25 minutes until golden brown and crispy. While the tofu is cooking, place the rice noodles in a large bowl and cover with very hot tap water. Let soften for 15-20 minutes. 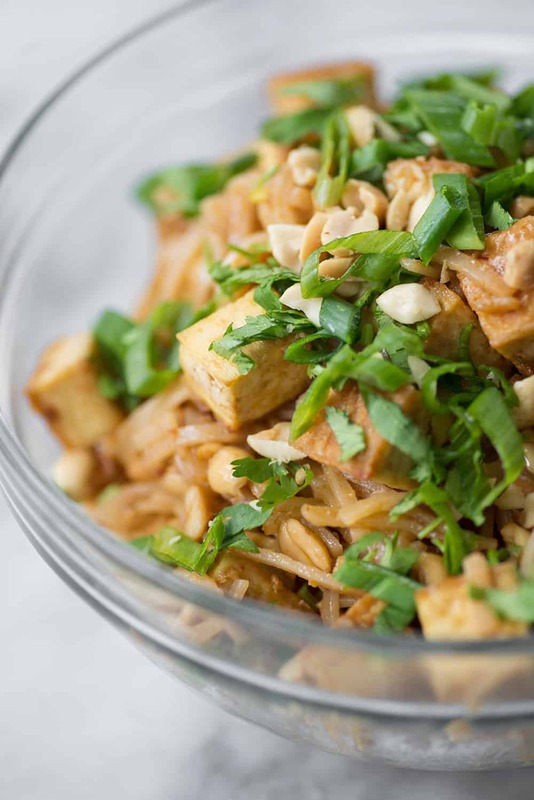 Place tofu in a bowl along with 1/2 of the sauce and 1/2 cup peanuts to marinate. In a large skillet over medium heat, add the tofu and peanut marinate and let cook for 5 minutes until sauce thickens. Add in the noodles and the rest of the sauce and stir fry for another 5 minutes or until softened, adding a tablespoon or two of water as needed if the noodles start to stick. Remove from heat and spoon into lettuce leaves, then top with desired toppings. To press tofu, wrap in paper towels and place a heavy object on top- or, use a tofu press. Thank you for discussing soy as a subject – it is amazing to me that it is still demonized so badly! 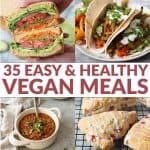 Although my blog’s meal plans are predominantly soy free (or are low soy and can be easily subbed, at the very least) I am a huge fan of the stuff. I halved the lime, doubled the garlic, and added mushrooms.